A teenage girl held her only bag of groceries tight, with two hands. She had waited two hours in line outside the Excelsior Gama supermarket in Caracas, Venezuela, for a couple bags of corn flour. When she left, at least 100 people were still waiting in line buy the same thing. A mile or so away is another supermarket, filled with food. It's just too expensive: Prices have doubled in a year. A bottle of Aunt Jemima maple syrup costs roughly a month's salary at minimum wage. The girl, who is 15, can't afford to go there. 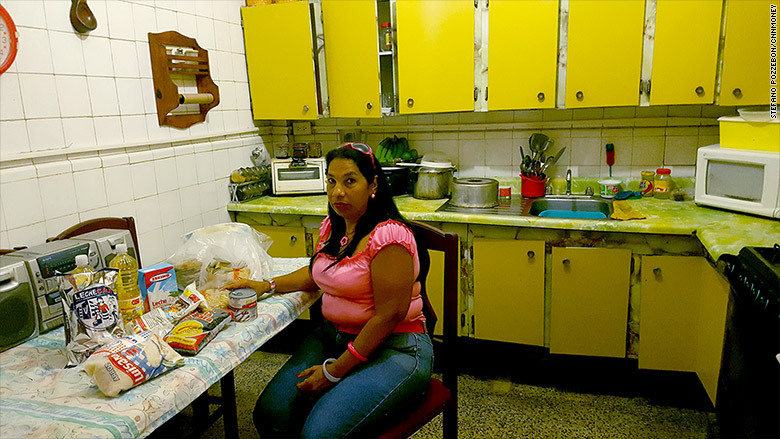 The food shortages in crisis-wracked Venezuela are a fact of her daily life. "Pasta, chicken -- I also don't have milk, nor sugar," she said one day this week, ticking off items she couldn't find. "I don't know if I have a future in this country." She had to stock up on whatever she could: Nearly all businesses in Caracas were shuttered Wednesday morning, the start of a two-day nationwide strike to protest a vote this weekend called by President Nicolas Maduro. The vote would enable Maduro to rewrite the constitution and, critics say, erode what remains of democracy in this country. His political movement came to power in 1999, promising to end inequality, but his policies and price controls have made it much worse, experts say. Food may be the best illustration of the crisis. Everyone is suffering from shortages or out-of-control prices. Millions of Venezuelans wait hours in line every day at government-regulated markets and go home with little or nothing. Food is available in private markets -- even plentiful. It just costs far too much for people who live in working-class neighborhood. Not far from Excelsior Gama supermarket is the lush Rey David Delicatessen, filled with all the pasta and chicken anyone could want. Venezuela's minimum wage for a month is 97,531 bolivars, or just over $10. At Rey David, a bottle of Aunt Jemima maple syrup goes for 95,230 bolivars. Margarita Porras saw the price of the syrup, gasped and put it back. She says it cost 10,000 bolivars only a year ago. "You can spend a minimum wage on one bottle of this?" says Porras, whose son sends her food from Miami. Skippy's crunchy peanut butter costs 82,600 bolivars. A bag of Illy coffee is 70,500. Pop-Tarts cost half a month's minimum wage, apple juice one-quarter. The price of Barrilla pasta has doubled this year to 8,860 bolivars from 4,000, according to the store manager, Juan Jose Sousa. Sousa says food prices rose more than 1,000% last year. 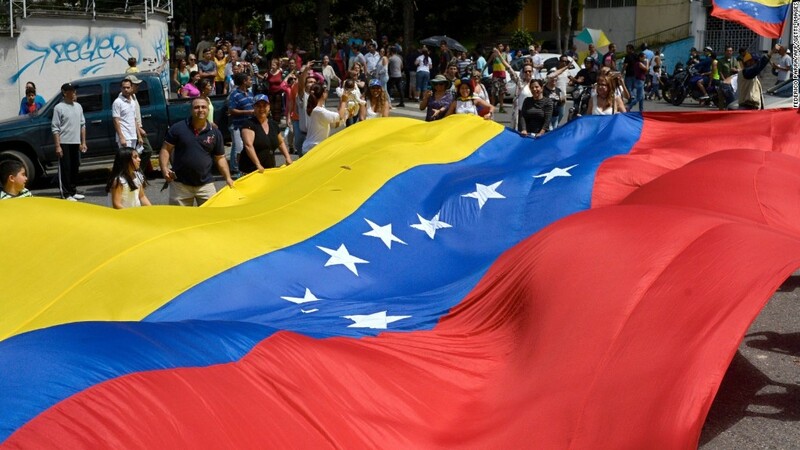 The average Venezuelan living in poverty lost 19 pounds during the year because of food shortages, according to a national poll. There isn't a local alternative to Skippy, Barrilla or Pop-Tarts. The Maduro government stopped managing nationalized farmland years ago. It depends entirely on selling oil abroad and importing food from other countries. The government tries to appease the poorest with a monthly bag of subsidized groceries and toiletries that costs a little more than $1. It's not enough for Josmary Hernandez, a mother who lives in a neighborhood loyal to the government. "We don't receive shampoo, deodorants," Hernandez laments, sitting in front of the little food she gets for an entire month. "The president promised we would receive that as well as toilet paper, diapers and the rest, but nothing." Hernandez, 55, sent her son to live in Argentina, one of many young Venezuelans who have fled. In the bag, she gets corn flour, beans, rice, pasta, dried milk and some canned items. Living alone, she says she can get by, but notes the bag lasts only a week for her neighbors with kids. Then they must wait in line. "The situation will get worse. Much worse," Hernandez says. "There is no future here."